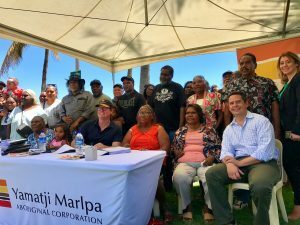 The Kariyarra People celebrated the signing of the Indigenous Land Use Agreement with the State of Western Australia on 29 September 2017 in Port Hedland. This was a landmark occasion. Since 2011, the Kariyarra People have been engaged in negotiations with the State of Western Australia regarding compensation for the expansion of the Port Hedland Port and a residential area in South Hedland; acts which occurred within the Kariyarra native title claim.